Welcome to Day 2 of my New Year's sketch challenge week. Happy 2011!!! Today's sketch is a little more complicated... I hope you like it. Yummy ribbon and Bakers Twine from The Ribbon Girl... in fact, the ribbon I've used is one of the ribbons you could win if you enter my challenge from yesterday. So, thanks to those who have already played along with yesterday's sketch, and I hope some of you play today too... I have more prizes to give. Enter below. And see you again soon for more sketch fun. This is such a fun challenge this week, Lucy! Your strawberries are adorable (what do husbands know anyway?! LOL)! 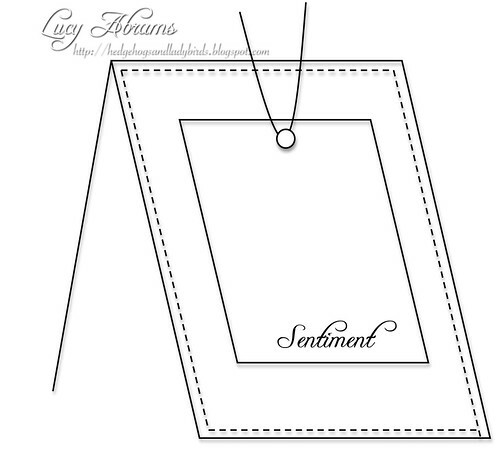 And that background recipe paper is sooooo PERFECT! Happy New Year, my SUPER talented friend! HUGS! Happy New Year Lucy! Thanks for the wonderful sketch, hope to play along again today! I love those strawberries! Husbands don't seem to like details, and I guess glitter is too much detail! Shame! Love, love, love the pink glitter strawberries. I don't know why some men can't appreciate the "cuteness" factor. (Speaking as one who's husband also struggles wth it). Super cute. Love everything about this card. Your blog cheers me! Great sketch and wonderful card! Love the colors and pretty berries! 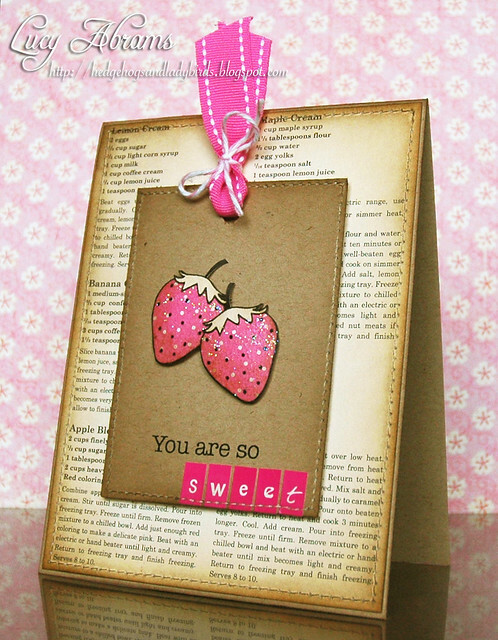 Love this sketch, Lucy...such a fun card, especially the glittery strawberries! Really wonderful distress details, makes the pretty pink colors pop! I'm enjoying this little series of yours - keep them coming! Beautiful! I love all the bright and pretty pinks! those strawberries look so yummy! lovely card! I love your card and am really enjoying working with your sketches. Can't wait for the next one! I love your cards and sketches, Lucy! Thanks for sharing them this week! I LOVE your sketches - so inspiring! THANKS!!! and I'll be back another day to see if I can get it to work for the other cards I'm making. Such a super cute card ! Love the pink strawberries !Dont worry too much about the dh, they have a thing about not liking Pink ! A brilliant sketch. I LOVE the strawberries, to me they look perfect (lol). Thank you so much for the challenge. Just found your Sketch Week sketches and LOVE them!! Had to play along and hope to try a few more. :) Thanks so much!